This is how we have made oars for our skiff, and it is for the Achiltiebuie syndicate who shared our timber order and anyone else who is interested. I offer it like a recipe from which the reader may get ideas. Ian Oughtred the designer of the boat has made a drawing of the oars and this is somewhat based on them but there are variations which I will explain. First of all what is the ideal oar length? The maximum beam of the boat is 5’6 and 2.5 times the beam is supposed to be the rule of thumb for Scandinavian rowing boats, making a maximum of 13’3. McKee (Working Boats of Britain) mentions 3 times beam which would be 16’6 but this would be long and heavy, besides being hard to keep out of waves on a rough day. Oughtred says 12′ so I reckon 13′ is worth trying because it’s easier to make an oar shorter than longer. Also our timber allows us 13′. What makes an ideal oar? It has to be strong enough not to break in hard use, but flexible enough to spring a little during the stroke. This is obviously subjective. In my experience an oar which flexes satisfyingly is also vulnerable to being broken by unfair use, i.e. sitting or standing on it between thwarts. The balance has to be right, which does not mean that it exactly balances at the gunwale, but that when the rower rests his or her arms and hands on the handle, the oar balances. This allows the muscles to relax on the return stroke. McKee says this amounts to 2 or 3 pounds light at the handle. Because of balance the oar must be as light as possible at the outboard end and needs extra wood (or lead) inboard. The blade has to be long and narrow because the oar does not feather in this rowing tradition and wide blades have a lot of windage out of the water. Also rowing in rough water makes it hard to precisely place a blade in the water and the long narrow blade works at various degrees of immersion. The rules of the skiff specify no hollows, i.e. no spoon blades, for ease of construction. There is no need, however, for the fore and aft faces to be the same, because the wear strips on the oar at the gunwale are asymmetrical, making it difficult to use port oars on the starboard side and vice versa. For this reason I have made the aft face flat and the forward face thick at the centreline and tapered to the edges. Ian specifies a blade 4/100mm wide and this looks right. I made ours with wings (the glued-on extra bits making the blade wider than the shaft) 41 long because that was the length I had, but they could be longer. The wings taper off slowly and melt into the shaft gradually to avoid a stress point. The tip is not cut off square but veed slightly to protect the corners of the blade, and a thin slip of hardwood is inset across the tip to bind the end of the blade. I have thinned the edges of the blade to 1/4/6mm which is as thin as I dare. The shaft section as sawn and rough planed tapers from the full 56mm square down to about 40mm square at the neck just above the blade. The neck is vulnerable and must be pared down with care. This is a compromise between strength and weight, and the density and straightness of the timber will be factors. Our Douglas is selected clear and better from Canada, has close growth rings and no knots. It is very strong and straight. Other timber used for oars is ash (hard, tough and heavy) and spruce (light, expensive, easy to bruise but probably the racer’s choice). It is possible to pare oars down after trying them in the boat, and I may do this. Finally it appears from looking at photographs of Faeroese boats that their wear strips on the oars extend wider and higher than the oar shaft, and have scalloped edges. These form notches which allow the humlibaund (lanyard keeping the oar against the kabe) to keep the oar from slipping in or out and thus altering the gear ratio. Different notches define different gear ratios, as the resistance of the boat changes up and down wind, for instance, or the rowers tire on a long row. 1 Using a chalk line, and then going over it with pencil and a straight edge, mark a sawing line down the timber. Our timber is 126x63mm, cut to 13′ or whatever length you want. The sawing line is slanted, so that it starts 25mm from one corner and ends 25mm from the diagonally opposite corner. Allowing for losing 4mm to the saw blade, this makes two oar shaft blanks 63mm thick and tapering from 99mm to 23mm wide over the length. The excess width at the handle end allows extra weight to balance the oar, and the taper is needed at the narrow end anyway. The dimensions are not precise, there is plenty of wood to be taken off later so don’t worry about errors up to say 6mm. As the oar evolves it will become apparent that the blank is not perfectly straight, and at every stage the removal of wood has to be done in such a way as to restore as much as possible the straightness of the final oar. This can be checked by sighting along it. 2 Mark the cut face of the blank as the aft face of the oar, and turn the blank so this is uppermost. Sighting along the blank from the tip end, mark a centre mark at the tip of the blank such that the final tapered shaft will be as straight as possible. In other words, if the tip is wandering off to your left, move the centre mark to the right so that when you taper the shaft down to 1/2/12mm either side of the mark, it will be straight. Having marked the centre mark, make a mark 1/2/12mm each side of it and snap a chalk line from those marks to the edges of the blank 62 from the handle end. Saw off the waste. 3 Plane the sawn faces of the tip smooth and straight with a sharp hand plane, where the wings will be glued on. Plane the gluing faces of the wings and glue them on, with the aft faces flush with the aft face of the shaft. This will make the aft faces a bit uneven but that planes off later. We used Balcotan because it tolerates cold temperatures and we had enough clamps to ensure good clamping pressure. Chalk line stretched to make one end narrow and one end wide. Hi ,I am part of the North Berwick team. Our skiff is progressing well and planking is now underway. I have been assigned to oar construction and found your blog very useful. Getting 12ft straight lengths of timber (that will remain straight) may be a problem.Did you source your Douglas Fir locally? Had you thought of laminating two pieces so that the tendency to bend was compensated? Also, have you more information on your Gearing ideas. We had a trial outing with the Kabes but the rope lashing was problematic. Too slack and the oar rattles about , too tight and it restricts the sweep. We did not have a source of enough local wood which was straight and long enough and enough for 6 oars (4 for the boat and 2 spare). Actually we went in with the Coigach boat so we needed enough for 12 oars. We went for Canadian imported Douglas fir, in the “Clear and better” grade. We ordered 63mx125mm 12 fee long, but they supplied longer lengths and charged us for them. About £300 for the whole order. You can get it from Robbins but it’s cheaper if you order it from a local timber merchant and they get it from the importers. It’s lovely wood, and there are photos of it on this website, close grained, straight and clear. I have made a Word document about the oar build which has now been put on the ‘Oar Making’ page. 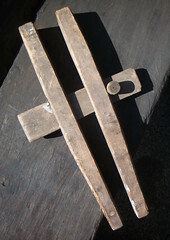 I started a discussion on the Scottish Coastal Rowing site forum (http://scottishcoastalrowing.org/scrforum/boats-and-boatbuilding/oars-kabes-and-humlibaundhumliebands/) suggesting thole pins as an alternative to kabes and humlibands (the lanyards) because like you I don’t like the slack. I favour a metal pin like the irish racing currachs but Alec seems to think it’s too technical. I do have an idea for the gearing but it has not been proven and may be too experimental for the class rules. I can’t understand the description of the Faroese system – can you point me to the photos if they are online? There seems to be a basic system all over scandinavia and shetland, which is a wooden pin (Kabe)of rectangular cross-section which sticks up from the gunwale in front of the oar and takes the forward thrust. A cord or rawhide band keeps the oar against it. Various local variations have the band (humliband)arranged slightly differently, and different arrangements of the wear strips which are attached to the oar on the front and the bottom, and the top of the gunwale (routh). Small boats seem to have the kabe and routh in one L shaped piece fastened to the gunwale, bigger boats like the skiff seem to have removable kabes which slot into the routh and gunwale. People in the UK who try the system seem to have some trouble with the degree of slack in the band. Too tight and it impedes the stroke, too slack and it lets the oar clonk about annoyingly. Other variations seem to be having a big notch in one or other oar wear strips so that the band is held in the notch and the oar cannot slip in or out, which in my opinion would be an advantage. Google Shetlopedia for good photos of the Shetland system. The idea of making asymmetrical oars is not one which we think is ideal, as it does not give a lot of flexibility. Let say you make six oars and 2 port oars break then you have a problem, if they are symmetrical oars you can continue on your way. We would be keen to explore the idea of making symmetrical oars, do you have any suggestions on a design, or comments on performance. I think we will be making our oars symmetrical after all, by putting wear strips on the front, top and bottom faces. I believe that there needs to be about 4 degrees of “dig” in other words the flat of the oar needs to be inclined 4 degrees from vertical so that it grips the water and tends to go deeper. In a symmetrical oar the blade has to be parallel to the forward face of the wear strip and so the kabe face has to incline 4 degrees. But this should not be a problem. Another thing to think about is that in some faeroese boats the bottom strip has notches to engage the humlibaund and stop the oar slipping in or out. In a symmetrical oar there would have to be two notches, one at the top and one at the bottom, or else the notch would have to be in the middle of the aft face of the oar. I think we will make the wear strips without notches and then design some way of gripping the humlibaund separately. Here is an update on the North Berwick oars. None of your technical sophistication and motorised pencil sharpeners…..we are carving the handles “out of the solid” . We made up a marking tool as shown on the John Welsford site to go from square to octagon to dodecagonal to round ! We are following the drawings supplied by Ian and are making symmetrical oars.There are some concave bits in the blade but they are symmetrical. I have made up templates to speed up marking-out of the blades etc.. We will probably use thole pins and the pin position can be changed in the rack according to the reach of the rower. I reckon that there is at least twelve man-hours needed per oar….any advance on that !! Thanks Hugh for that update. I have been trying to estimate where in the length of our oars the pivot point will come. It will only become obvious what is optimum when we go rowing, but there are some pointers in books. The ratio of length outside the boat to the length inside is the important one. The extreme ends of the oar are not the effective points where the forces act, and I have taken the middle of the long two-handed handle as the inboard end for the purposes of this ratio. That is, the effective inboard end point is 7 inches in from the end. At the blade end, I have used 20% of the blade length in from the end, which is 9 inches. This makes the effective length of our oars, which are 13 feet 2 inches long, 158-7-9=142 inches long. The gearing ratio mentioned above will be somewhere between 1:2 (heavy weather and/or weak rowers) and 1:4 (tailwind and/or strong rowers). My estimate is between 1:3 and 1:2.5. At 1:3 the oar is divided into 4 parts, one inside the boat and three outside. That would mean the inside part being 142 divided by 4 = 35.5 inches, so the total length inside will be 35.5+7=42.5 inches. At 1:2.5 the numbers are 142 divided by 3.5=40.5 inches. Total length inboard = 40.5+ 7 = 47.5 inches. The most critical rowing position in the boat is the aft one, where the beam between kabes is the least. The oar described above just clears the gunwale when the handle is in the aftermost position at a ratio of 1:2.25 and I think that means our oar is the maximum length practicable. It remains to be seen whether that is optimal, but they can be shortened more easily than lengthened. We launched yesterday and it was lovely to row in our boat after all this work. The optimum pivot point is looking like about 3.5 or even 4 to 1, indicating a fast boat indeed. I am off to screw stop blocks to the forward faces of the oars to stop them sliding inboard, which was a problem yesterday. Well quite a lot to report. First, the formula I was using for gearing turns out to be different to the normal. The accepted formula is that gearing = outboard length of oar to extreme end / inboard length to extreme end. I was using points a bit in from the ends as the effective ends, which is more accurate but not easy to compare with other people. By this formula we need a gearing of about 3.1. The problem is that with our 13ft 2inch oars we are banging each other in the back in the middle of the boat. It’s not a problem for the stroke oar but is for the others. The Coigach Lass has two 15ft oars which are better and also whippy which is nicer to row with. I reckon we need 16 or 17ft oars and as a temporary measure have extended our blades massively. We will try them tonight and report back. Tonight (Tuesday) we tried the 17ft oars and they were much better. No collisions between rowers and long full strokes. Needs 4 pounds of lead on each handle though. I am going to take 6 inches off them because one was flexing alarmingly. But long oars are the way to go, if anyone reads this. I wonder what the concensus on Oars is now after the races?? My inclination is that Ulla oars were too long and the Berwick oars may ahve been on the short side (how long are the Berwick oars?). The shorter the oar becomes the faster the stroke rate becomes which I think would be tiring in a long race. I read that an oar for a Skiff should be twice its beam putting them at 11 – 12 foot for the St Ayles skiff, but that they should be slightly longer for racing. I think think the look and feel of the traditional wooden Kabes is great, but I do think the stainless pins have the edge where racing is concerned – what do you guys think? Sorry not to reply earlier. Oars are the big question right enough. Some of our crew rowed and some of yours rowed the Port Seton boat at Portsoy and came back raving about how easy it was to row, and I now think big oars are not the answer, at least for sprints. The basic problem is that oars between about 12 and 14 feet, which would be the natural lenght to use, cause the rowers to sit along the centreline of the boat where those with a long reach clash into the back of the next rower. This can be avoided by staggering the rowers, either away from the kabe with a long oar or towards the kabe, as with Port Seton, using shorter oars. As you know we extended our 13ft oars to 17ft, and needed 4 pounds of lead on each to balance it. They were gradually whittled down and are presently 14ft 2 inches and much thinner. They are probably as short as long oars can be, and still avoid the next rower’s back. I have discovered that 11 ft oars work as short oars, which is a foot longer than Port Seton’s oars. We have made 4 cheap oars from selected B&Q wood which cost £1.50 each and have 3mm plywood blades and stainless pins. They don’t have the stainless rings but just have holes bored right through them for the pins. Last night we powered through the surf (look on youtube for the footage) with them and did not break them, even though they are very light. So they are looking good so far. We currently think that Port Seton’s setup is good both from the stainless pins (low friction and no slipping in or out of the oar) and the light oars (low inertia at the beginning and end of the stroke). So we have travelled a long way from my first oars which were too massive. Probably more development to come. for shaping the looms of oars. This is a great tool and does the job so quickly compared to the traditional method of quartering, eights and so on. Is this tool available commercially and from where, or is it your own private invention. Any information would be greatly appreciated. You can get round tenon cutters from Lee Valley tools on the internet, as we did, in many different diameters, but if you want a long handle you need to cut the cutting tool into two parts and extend it with a piece of tube. The tool is gripped in an electric drill and the workpiece is clamped. We found that you need to line it up well because once started it runs straight and cannot be steered. We made a crude set of wooden bearings to hold it on the correct line for the first 4 inches, after which it was a freehand job. Ours makes inch and three quarter handles 15 inches long. For your project you would want a smaller diameter. Last night we tried out some new 11ft oars with plastic wear plate/thole pin holes, new adjustable footrests, seat cushions, German rig, and 8 oars. The new oars are like the previous small oars except instead of having the thole pin hole drilled through the oar, there are three holes (for different gears) in a plastic plate screwed to the bottom of the oar. the plate takes the bottom wear and the holes project forwards from the front face of the oar. GPS speed testing showed that the plastic plate oars were about 0.3 knots faster than the same size oars with the kabe setup, and rowers reported that at full power it was better not to have to concentrate on keeping the oar at the correct position in or out. The middle “gear” or hole was the best for sprints but the other holes had uses up and down wind. With 8 oars the oars were too heavy outboard, and some clashed amidships, especially at the narrower stations. It looked and sounded great, however. We would need lighter slightly shorter oars for that if it were to be pursued. The footrests made a vast difference. They need slight fettling to be more easy to adjust. Some liked the angle as it was, some liked chocking them up to a steeper angle. Seat cushions improved the geometry and made the seat more comfortable, so we will get some. In theory the German rig, where yaw moments are equalised by making the rowers port, starboard, starboard, port, should yield some improvement, but the two adjacent rowers on the same side clashed both inboard and outboard so we abandoned that. Tonight we tried short oars which had the thole pin hole projected 2 inches further forward than the previous ones. I should say that when we tried thole pins we inserted them in holes drilled not in the gunwale but in blocks which fitted in the kabe sockets. In other words we did not drill the boat itself so that the change was reversible. This made the aft face of the thole pin some 1 inch forward of where the aft face of the kabe used to be, effectively moving the pivot of the oar an inch forward. We decided that it would be better 2 inches aft of this so rather than drill the boat for a different thole pin position I made oars with the plastic hole plate extended by 2 inches. It’s clumsy but it works better than the previous one so now I will extend the routh (gunwale wear plate) to match. The current best setup is now 11 ft oars with the pivot 12 inches aft of the aft edge of the seat rather than 11 inches as in the plans, plastic (polypropylene) wear surfaces, seat cushions 2 inches thick, better footrests, and soon a rudder to replace the steerboard. I hope readers are keeping up with the white heat of development in skiffology. The oars with extended wear plates clashed with wear plates on the gunwales in an unexpected way, even though the gunwale plates were at right angles to the pins. So we removed the gunwale plates and put top plates on the oars with slots allowing the oars to be raised and lowered into the water, but held them in pitch. To keep the oars off the gunwales the old wooden pin blocks were used, modified into rounded mounds which just touched the oars in one place near the pin. Looking at all the many oar systems in use at Cumbrae, apart from the RWSBC featherable oars, all were fixed in pitch and all took their pitch reference from the gunwale and not the pin. Ours currently takes its pitch reference from the pin, and it works well without any clonk. What does not work is to take a reference from both pin and gunwale because there will be a clash. Currently we have a system which works well and is close to what we want. There is no clonk and that is an improvement on all the traditional systems. It is now obvious that the pins are too far forward, which is why the current oars have 2 inch extensions to move them aft. The plans call for the aft face of the kabe to be 11 inches aft of the aft face of the seat, and to avoid making more holes in the boat we put the pins in blocks in the kabe holes, which made the pins 1 inch further forward. Now with the 2 inch extension the forward face of the oar is 12 inches aft of the seat and we think it could be further. In the Basque boat it is 16 inches. We will experiment to find the best position and then move the pins. Then we can make new oars or modify the old ones.